Our Pumpkin Spice Cheesecake with Caramel Sauce is an indulgent twist on our old Thanksgiving favorite. Take a respite from the beloved pumpkin pie and serve up a crowd-pleasing, family wowing dessert! It’s that time of year when the majority of us fall under that magical pumpkin spell. It knocks at our door first, in the form of coffee. Well placed ads that lure the tired and groggy to spend $5 bucks on a most delicious cup of Joe. Topped with whipped cream and sprinkle of cinnamon, I won’t tell if you won’t! It kicks off the season with a bang! 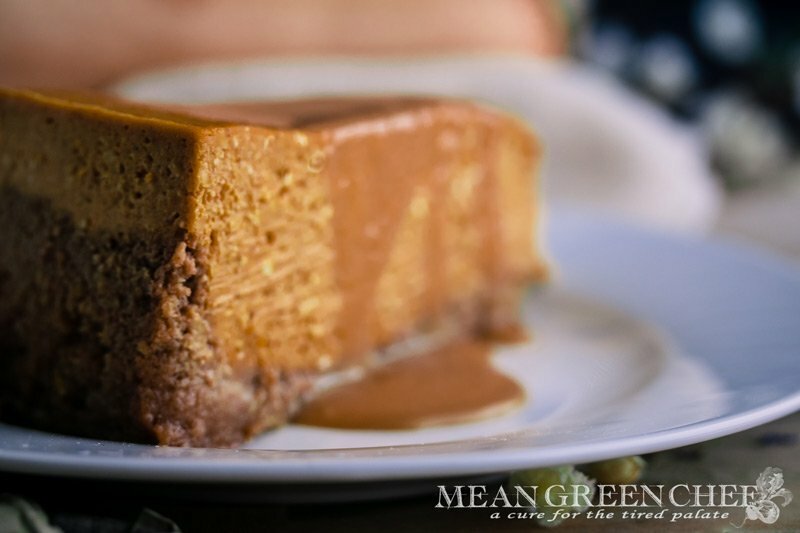 We love all things fall and our Pumpkin Spice Cheesecake with Caramel Sauce is really a special dessert. Although it looks like a difficult recipe, really it’s not and if you have any questions along the way, ask on our FB page and we’ll help out. Use room temperature cream cheese: Always (always) use room temp cream cheese. When a recipe calls for softened cream cheese, this is what the author is referring to. Softened cream cheese blends better and is creamy when mixed. Cold cream cheese results in a lumpy batter that will reflect in your cake. Allow it to sit out on the counter in its original container for 30-60 minutes. The addition of flour or cornstarch: Some cheesecake recipes call for a little flour or cornstarch. This small addition helps keep your cheesecake from cracking and also makes the cake easier to cut into cleaner slices. Also giving the cheesecake an exquisite character and texture. The Baine-Marie Bath: A fancy name for a water bath that creates a humid environment, allowing the cheesecake to cook gently. This climate aids in creating an irresistibly smooth and creamy cheesecake. That is less prone to cracking and drying out. The method: Wrap the outside of your springform pan with heavy-duty aluminum foil, this keeps the water from seeping through any crevices in the pan. We use the extra wide heavy-duty foil. Fill your pan with your batter and set it inside of a roasting pan or another large baking dish. Then, fill the roasting pan with very hot water, about halfway up the sides of the springform pan. The water should not go above the top edge of the aluminum foil on the springform pan. You want to add enough water to the pan to ensure that the water does not fully evaporate while baking. Limiting Cheesecake Cracks: Cracking typically occurs if a cheesecake is overcooked or cools too quickly. Bake your cheesecake until the outer edge is rather firm but the inner circle 3-4 “ is still jiggly in the very center of the cake. Cool your cheesecake gradually: allow it to sit in the turned off oven with the door closed for 30 minutes (as per the directions below). The cheesecake will continue to bake but slowly cool as well. Then crack the oven door and leave it to continue to cool in the oven for another 30 minutes. This system continues to fight against cracks forming in the top of the cheesecake. After the time in the oven has elapsed: remove from the oven. Take the cheesecake out of the water bath, and remove the aluminum foil. Set on a rack and cool completely. Always Chill Cheesecake after Cooling: Once your cheesecake has cooled off, be sure to allow it to chill overnight. This practice ensures that the cake has the proper texture and is set properly. Cutting a cheesecake before chilling will give you a custard-like quality, which is not what we are looking for when serving a cheesecake. Chilling produces a rich, smooth, mouth-watering texture! Prior to cutting: hold a long non-serrated knife under hot tap water for a minute. Wipe the knife off on a clean kitchen towel before making every cut. You can also slice a cheesecake with non-minty dental floss or a wire cheese cutter as well. Freshly baked cheesecake will keep in the fridge for about 1 week, securely covered with plastic wrap. Cheesecakes also freeze extremely well! Once your cheesecake is set and firm, set in the freezer for about an hour. Then remove and wrap tightly with plastic wrap and then a layer of heavy duty aluminum foil. properly stored it will preserve its highest quality for 2 months. To serve after freezing, thaw for a few hours on the counter top or overnight in the fridge. Then cut, top and serve! Preheat oven to 325°F/163°C. Line a 9-inch (23cm) springform pan with parchment paper in the bottom and grease the sides. Measure out and combine the crust ingredients in a small bowl. Press the mixture into the bottom and about halfway up the sides of the springform pan. Cover the outsides of the pan with aluminum foil so that water from the water bath cannot get in. Set the prepared pan aside. In a heavy saucepan, over medium-high heat, stir the pumpkin, sugar, cinnamon, ginger, nutmeg, cloves, and Kosher sea salt together. Cook stirring frequently allowing the mixture to bubble gently. Until thicked caramelized in color and shiny, about 5 minutes. Pour the mixture into a mixing bowl, scraping the sides of the pan. Beat on medium speed for 2 minutes, ensuring mixture is well combined. Add the cubed room temp cream cheese and all-purpose flour. Beat on medium until combined and smooth, with no cream cheese lumps visible. Add the cold cream and mix well, then add the eggs one at a time. Combining well after each addition. Scrape down the sides of the bowl as needed to make sure everything is well combined. Be sure to overbeat! Pour the cheesecake batter evenly into the crust. Place the springform pan inside another larger pan. Fill the outside pan with very hot water about halfway up the sides of the springform pan. Making sure the water does not go over the top of the aluminum foil. Bake for 1 hour 15 minutes. The center should be set, but still jiggly about 3-4” from the center. Turn off the oven and leave the door closed for 30 minutes. The cheesecake will continue to cook, but also slowly cools down. Crack the oven door for 30 minutes to allow the cheesecake to continue to cool gradually. This process helps prevent cracking. Remove the cheesecake from the oven, and remove the aluminum foil. Set on a rack to finish cooling completely. Cover with plastic wrap and refrigerate until chilled, at least 4 hours or overnight. Stirring constantly with a heat-resistant spatula to knock back the foam, simmer until caramel registers 225°F (107°C) on a digital thermometer, about 3 minutes. Transfer to a heat-resistant container, stir in vanilla extract (if using), and cool to room temperature. pour into a heat-resistant jar. Caramel will thicken as it cools. Remove the outer ring from the springform pan. If moving to a serving platter, slide a thin metal spatula between the crust and pan bottom to loosen, then slide the cheesecake onto the platter. You can also leave on the cheesecake on the bottom of the springform pan. If the cheesecake is damp, daub it with a paper towel. Allow the cheesecake to stand at room temperature for about 30 minutes, then slice. Warm up the caramel sauce on the stovetop or in the microwave, adding a little cream if it's become too thick. Drizzle the caramel sauce over each slice and serve. Cheesecake will store safely in the fridge 4-5 days. Cheesecake can be frozen for up to 3 months. To freeze: place the cake in the freezer for 30 minutes, unwrapped, to firm up. Then double-wrap it tightly with plastic wrap and then heavy duty aluminum foil, or place it in a heavy-duty freezer bag. Thaw in the refrigerator the night before you plan to eat it. If you’re looking for other dessert ides, then be sure to check out our other recipes too! We 💙 LOVE 💙 seeing your creations! So don’t forget to tag us @meangreenchef or #meangreenchef so we can see what’s happening in your kitchen! I am adding this to my list for Thanksgiving. It looks delicious and with the tips you provided I bet I can make it. This looks just divine! Iam going to try my hand at this! Thank you fir posting such a delicious recipe and tips! So beautiful and perfect for Thanksgiving! I need to buy a springform pan, I keep using my pryer but feel it ruins the presentation a little. There is nothing better than pumpkin cheesecake for Thanksgiving! The caramel sauce just takes it to the next level! This looks so good! Cheesecake is one of my favorite recipes. Great tips to keep it from cracking! This looks amazing! I love cheesecake and I love pumpkin anything! I am all about everything pumpkin right now. Looks amazing. The cheesecake receipe sounds good. Wow does that look and sound delicious! Definitely trying this, this year. Angela, this looks absolutely delicious!! I can not wait to try this!! Thank you so much for the tips and the recipe!!! Oh, I’m in trouble. This one looks like a must-try this year. Oh, wow!!!! You had me at “pumpkin”. Looks absolutely delicious. Adding it to my recipe list. This looks delicious! Not only the recipe is amazing, but I also loved the tips! Cheesecakes have felt always very tricky to me!! I’ll take note of this!! Thank you! Pumpkin makes everything better. And I love the tip about how to cut it with ease! I love cheesecake, and I love pumpkin. This sounds awesome! Oh my goodness! This looks and sounds amazing. 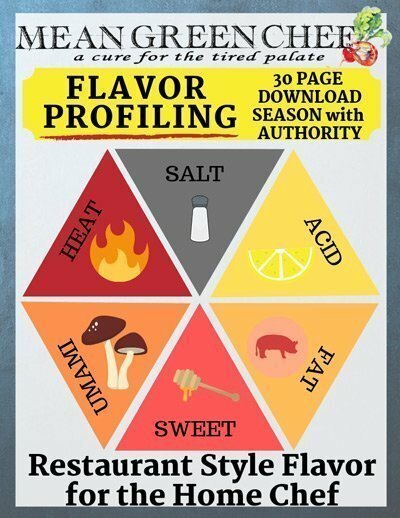 Pinned and going to give it a try for Thanksgiving! This looks so good! I have never made cheesecake but I may just have to try this! This looks so good! Cheesecake, Pumpkin Spice and Caramel. It doesn’t get much better that that. Now to convert it so we can enjoy it! Thanks for sharing! Yum! Great picture! looks very appetizing! That looks like a delicious recipe. Thanks for sharing! Looks amazing. Never though about adding a sauce to cheesecake but it’s probably delicious. The minute I saw the picture of the cheesecake, my mouth started the water. Sounds like a fun recipe and great tips on how to store your cheesecake. This looks so delicious, I might have to trade it out for my traditional pumpkin pie on Thanksgiving! I haven’t made a cheesecake in a long time. This looks delicious!! oh this looks delicious! I never made cheesecake before but I do love pumpkins and cheesecake. Yum!!! This sounds like a fabulous dessert to add to my Thanksgiving list. I wish I saw this earlier, but it is never too late to have some pumpkin!! Thank you for sharing this! !